WASHINGTON (AP) — The White House is discussing a plan to oust Secretary of State Rex Tillerson and replace him with CIA Director Mike Pompeo in a major shake-up of President Donald Trump’s national security team, administration officials said Thursday. The move would put Pompeo, a former congressman who has grown close to Trump during his tenure atop the CIA, in charge of U.S. diplomacy. 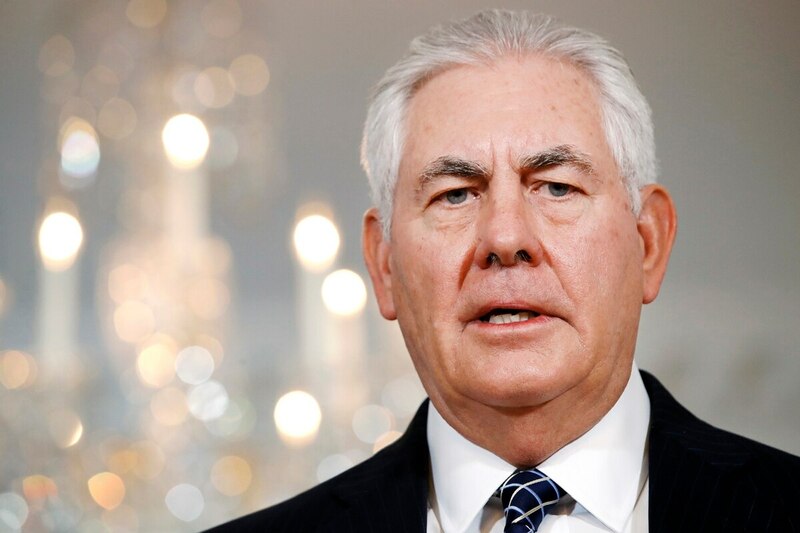 Tillerson, the former Exxon Mobil CEO, has had a rough first year characterized by tensions with Trump in several foreign policy areas and overwhelmingly negative publicity over Tillerson’s planned overhaul of the State Department. Tillerson’s likely ouster loomed awkwardly over an Oval Office meeting Thursday between Trump and the visiting crown prince of Bahrain. Asked by a reporter whether he wanted Tillerson to stay on the job, Trump was coy, merely pointing out that Tillerson was in fact in the room for the meeting. “He’s here. Rex is here,” the president said. A White House official said it was unclear how soon Tillerson might be replaced, and word of the plan appeared to catch Tillerson and his staff off-guard. Tillerson aides and the State Department did not immediately respond to requests for comment. The New York Times, which first reported the potential shake-up, said it was likely to happen within several weeks. Nor was it clear whether either Pompeo or Cotton had been formally approached by the White House about the potential new roles. Yet several administration officials said that Pompeo has said in the past that he’s open to taking the job. White House spokeswoman Sarah Huckabee Sanders said there were no staffing changes to announce and hinted that Tillerson would likely remain at least until year’s end. We've got you covered. Sign up to get the top federal headlines each morning. “Secretary Tillerson continues to lead the State Department, and the entire Cabinet is focused on completing this incredibly successful first year of President Trump’s administration,” she said. The White House started telling people in September that Tillerson would be replaced, said a senior administration official. By that point, some issues that needed sign-off from the secretary of state were being put off until after Tillerson was gone, said the official, who like others wasn’t authorized to comment publicly and demanded anonymity. Word of the White House plan will significantly complicate Tillerson’s ability to conduct diplomacy and run the State Department for as long as he stays, given that foreign governments may now consider him a “lame duck.” Foreign leaders had anticipated Tillerson was likely to attend a scheduled gathering of NATO foreign ministers next week in Brussels, though the State Department hadn’t confirmed that. Associated Press writers Zeke Miller, Richard Lardner and Darlene Superville contributed to this report.